Strength – Strength represents a character's capacity for exertion of force. It affects a character's ability to lift, pull, and push objects. It is the characteristic that defines a character's ability to throw a punch or stop an object. Strength is a characteristic core to an individual's ability to strike their opponents. Constitution – Constitution represents a person's resilience, defining that person's ability to withstand punishment. It affects characters' ability to receive blows during a fight, stave off sickness, resist poison, and mitigate pain. Constitution affects characters' endurance, and is a characteristic core to an individual's survivability in any given combat engagement. Stamina – Stamina represents both a character's physical and spiritual energy. It determines characters' chakra reserves. As a result, it governs the number of techniques that a character can perform, and how long they can sustain a fight. Stamina is spent as from a pool in order to utilize techniques, and is refreshed while a character is resting. Reflex – Reflex determines how fast a character can move. It affects characters' reaction time, ability in the performance acrobatics or dodges, the swiftness with which they can maneuver weapons, and so on. Reflex definitively governs the actual speed of a character's movements. Coordination – Coordination affects how efficiently a character can move. Coordination governs fine motor control. A character's accuracy with weapons, much of their skill with swords, and their balance are all closely related to Coordination. Wisdom – Wisdom can best be explained either as a character's knowledge or their incredible insight. It governs a characters' ability to discern events, predict enemies' actions, and extrapolate information. To some degree, it is also affects a character's attention to detail, as well as their ability to process information. Its extremes do not define a character as "stupid" or as "smart", though either end can represent a character who is one of those two things. Poor – You are deficient in this Attribute, comparable to a child or someone with a severe developmental disease. Average – You are within the adult human average in this attribute. Proficient – You are considered highly skilled in this attribute. Masterful – You are exceptional in this attribute, approaching the highest limits of natural human ability. Epic – You are beyond extraordinary in this ability, able to warp the bounds of physics and reason. Legendary – You are widely renowned for the use of attribute, capable of feats considered impossible even by the standards of most shinobi. Godlike – You transcend even legend, and have attained supremacy in this ability and will often be deified for its use. While tiers are the primary increment used to categorize Attributes, and are often the only increments upon which certain factors (such as the outcome of some techniques, or the benefits provided by the Attribute such as Durability) depend, using the Character Points system or Attribute-boosting techniques, a character might find their Attributes divided into smaller increments. These are called advantages, and there are two kinds of them in each tier (Minor and Major). They come into greatest affect when facing someone with an equal tier, e.g. a masterful agility with a minor advantage facing just a masterful agility will be slightly faster than the guy without the minor advantage. If he had a major advantage then he'd be even more faster. If it was a masterful with a major advantage vs a masterful with a minor advantage, then he'd only be slightly faster(the same as if it was a minor vs no advantage). These advantages do affect different tiers, but not by a lot. A masterful agility is still faster than a proficient agility with a major advantage, just not as much as they'd be if facing a proficient with no advantage. Boosts can bring you above Godlike, but you cannot purchase advantages at Godlike. To better understand the grasp of each tier, here is a list of comparisons for each attribute. Poor, Average, and Proficient attributes are more common among varying groups and are noted as such: Poor attributes represent those of a child or someone suffering a disease; Average attributes represent what would commonly be found among developed genin or the average man or woman; Proficient attributes represent what would be commonly found among most skilled shinobi, such as chuunin and above, or simply someone who is considered impressive in that area by the average person. Epic - Comparable to Sakura with chakra-enhanced strength. Legendary – Comparable to the Fourth Raikage. Godlike – Comparable Tsunade using chakra-enhanced strength. Masterful – Comparable to Rock Lee. Epic - Comparable to Naruto's endurance. Legendary – Comparable to Kushina at the time of her death. Godlike – Comparable to the Third Raikage’s endurance. Masterful – Comparable to Kakashi’s stamina. Epic - Comparable to Jiraiya's stamina during his fight with Pain. Legendary – Comparable to Kisame’s stamina with the aid of Samehada. 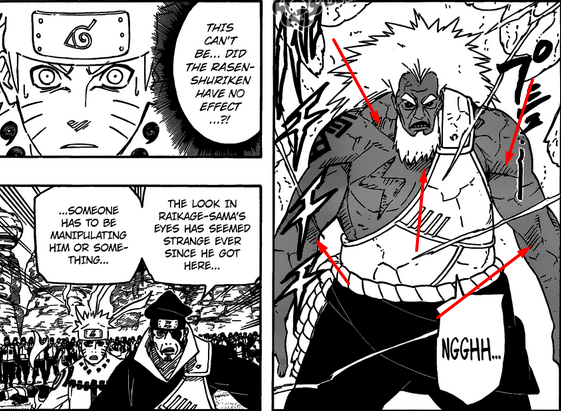 Godlike – Comparable to Naruto’s stamina, with access to Kyuubi’s chakra. 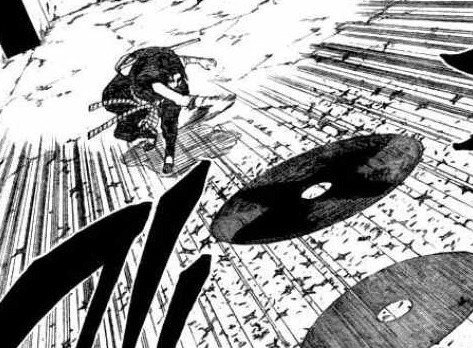 Masterful – Comparable to pre-shippuden Rock Lee's agility with weights on. Epic - Comparable to Itachi. Legendary – Comparable to the 4th Raikage with LRA active. Godlike – Comparable to KCM Naruto. Masterful – Comparable to Tenten. Epic - Comparable to Sasuke. Legendary – Comparable to Itachi Uchiha. Godlike – Comparable to Mifune while using Iaido. Masterful – Comparable to Shikamaru. Epic - Comparable to Jiraiya. Legendary – Comparable to Madara. Godlike – Comparable to The Great Toad Sage. The series of guidelines below outlines the more intricate interactions between certain circumstances with regards to certain Attributes. Constitution, being representative of a character's endurance and their body's ability to take punishment, has a variety of effects with regards to altering interaction with a character's environment. From dealing with extreme temperatures and shrugging off poisons to taking punches and staving off death by exsanguination, Constitution has a variety of tangible effects, delinted by the guideline below. Poor Constitution: Your body is weak. You are more susceptible than most to bleeding out, getting dehydrated, freezing, or hunger. You gain no bonuses, and may experience penalties where applicable. Average Constitution: Your body is that of a normal human. You can bleed, be hurt, freeze, and burn, but no moreso than any other normal person. You gain no bonuses, but face no penalties. Proficient Constitution: Your body is that of a vigorously healthy human. You can ignore some amounts of pain, such as a severe burns, missing fingers, or a broken bone. Masterful Constitution: Your body is beginning to extend human limits. You can ignore large amounts of pain, including multiple severe burns, missing appendages, or non-fatal stab wounds. You can continue operating, even with broken legs and arms, at a two-tier (2) penalty to your Strength, Reflex, and Coordination. Epic Constitution: Your body transcends human durability. You shrug off almost all pain, and only the most major of wounds can pierce through your ability to do so. Aside from the highest rank fire ninjutsu, you don't feel the pain caused by burning, though this does not mean you do not burn. You can't bleed out from a wound, as your blood clots inhumanly quickly. You can continue operating even with broken arms or legs, at a one-tier (1) penalty to your Strength, Reflex, and Coordination. Most other broken bones do not bother you, and you can ignore a single (1) sensible fatal wound (i.e, not losing your head, being disintegrated, etc.) for two (2) posts, to either continue a battle or find a source of healing. Legendary Constitution: Your body is completely superhuman. You shrug off all pain, you can go months without food, and you can last weeks without water. You can hold your breath for an inhuman number of minutes. You cannot bleed out from wounds, and you can operate with broken arms and legs without any penalty. Your bones are harder to break, and are like rock. Non-fatal wounds will not phase you in terms of your mobility or health, and you can ignore a sensible fatal wound for up to four (4) posts. Godlike Constitution: Your body is godly. You shrug off any pain. Your blood instantly clots when you are cut, meaning you do not bleed. You can manipulate your body to its full extent despite any wounds you receive. A broken arm does not phase you, and provided the bone isn't smashed to pieces, can still be manipulated. Your bones are harder to break than regular bones, and are like steel. You rarely need food or water to survive, and can hold your breath for a seemingly impossible amount of time. You are very resistant to both cold and heat, and are practically never bothered by the weather. Non-fatal wounds do not phase you, and sensible fatal wounds can be ignored for up to six (6) posts. Beginning at Masterful, the character gains 15 Durability. Any attack of reasonable Strength damages Durability. This seems weighted toward Durability in that you cannot just bring down an equivalent Durability with a single strike. This is intended, so that characters feel more like their 'Anime' counterparts and can take a couple hits before needing to worry about getting their throats cut. What happens when Durability runs out? Well, you take damage normally. At this point a child could drive a dagger into your eye, because it's squishy and an eye and all your plot armor is gone. I wouldn't try tanking too much after that point. When boosting Constitution via a technique or similar thing, you gain the difference between your unboosted Durability and your new Durability, even if your Durability was damaged. For example, if a person with Masterful Constitution is hit by two Great Fireball techniques, removing ten of their Durability (as is the norm for two C-rank techniques), and they go on to boost their Constitution to Epic, they would only gain 5 additional Durability (the difference between Masterful and Epic). You cannot gain that extra Durability more than once. The next time you wanted more Durability, you would need to boost beyond Epic (to either Legendary or Godlike) to gain additional Durability. The below is a guideline for reference as to how many techniques a character can use given any given amount of Stamina. Note that the guidelines, like most others in this section, does not represent hard limits on what characters can and cannot do. The actual range of flexibility with these guidelines is something left to the discretion of those with whom you are roleplaying. Poor can do one A-rank, or three C-ranks, or eight D-ranks. Average can do two S-ranks and a B-rank, or five B-ranks. Proficient can do five S-ranks, or ten B-ranks, or four A-ranks, an S-rank, two C-ranks and a B-rank. Masterful can do seven S-ranks and a B-rank, or ten A-ranks. Epic can do ten S-ranks, or one-hundred D-ranks. Legendary can do ten S-ranks and five B-ranks. Godlike can do twenty-five S-ranks. E-ranks are not accounted for by this guide because they use a marginal amount of Stamina. It is important to note again here that techniques cannot be reduced in cost to E-rank. Advantages (or disadvantages) in a character's Stamina slightly modify the maximum number of techniques you can use. A Minor Advantage increases your maximum by roughly 1/3rd of the difference between your current tier and the next tier, and a Major Advantage increases it by roughly 2/3rds of the difference. In general, stamina advantages simply let you bend the listed maximums much more than what is normally acceptable. Reflex and Coordination are Attributes linked in a unique way; as both Reflex and Coordination govern body movement, both must be taken into account when considering the actions of one character relative to another. Additionally, both share governance on certain aspects of gameplay. The most notable examples, hand seals and tracking, have their relationships with Reflex and Coordination delineated below. The below is a guideline for how many han seals a character can perform in any single post given their Attributes. The Attribute that a character uses to determine the number of hand seals that they can perform in a post is always the lower Attribute between Reflex and Coordination. As always, the below is just a guideline, and does not represent a hard maximum that a character can ever perform in a single post. Poor: About 12 hand seals every post. Average: About 30 hand seals every post. Proficient: About 60 hand seals every post. Masterful: About 120 hand seals every post. Typically, hand seals are visually unrecognizable past this speed. See the tracking guidelines below for more information. Epic: About 200 hand seals every post. Legendary: About 350 hand seals every post. Godlike: About 500 hand seals every post. As with determining the specific hand seals that those with high Reflex or Coordination form, normal eyes cannot accurately track the movements of those with Reflex higher than Masterful. While this doesn't mean that those moving outside of a character's range of tracking are so fast they cannot be seen, characters who possess insufficient ability to track an individual with high Reflex cannot determine the specifics of that individual's actions. Normal eyes also cannot accurately track the fine movements of someone with Coordination higher than Masterful; the exact path of a thrust with a hand or a weapon may be rendered a blur for them. You may replace your characters' base tracking, which is Masterful, with their natural tracking, which is equal to either their Reflex or their Coordination (whichever is higher). For example, if your character had a natural, not-boosted Legendary Reflex or Coordination (bought with CP) their tracking would extend up to Legendary rather than up to Masterful. If they had Average Reflex and Coordination (bought with CP), their tracking can remain at the base of Masterful. On top of a character's base or natural tracking, appropriate tracking bonuses (such as from the Sharingan or certain Fighting Styles) are applied. Tracking may pass Godlike and reach Boss. Wisdom gives characters the ability to discern information that may otherwise be considered meta-gaming by that character's player, and alters how your character may react to certain situations and events. This guide delineates what a character's experience with something before interacting with it in-character might be, as well as that character's ability to predict their opponents' actions. Though it shouldn't need to be said, if your character has experienced or seen something in-character, then they’ll know about it regardless of their Wisdom. Wisdom also includes a resource called "Precognition", these are almost like Spiderman's Spider-sense, a kind of foreboding of something about to happen, allowing you to react to something that normally you would be unable to. Please note, you only recognize canon techniques from clans if your Wisdom would qualify you to recognize that clan. No additional information available for your character. Access to general knowledge of canon ninjutsu, genjutsu, and taijutsu of D-rank and below. Able to recognize foreign villages' headbands. Able to recognize the clans and bloodlines from your own village. Access to general knowledge of canon techniques of C-rank and below. Able to recognize foreign villages' Kage (assuming that the Kage in question has been around long enough to make a public appearance and have their image known). Able to learn A-ranks without a sensei, the Character Points perk, or the chūnin rank. Know about the bijū (but not necessarily who is the jinchūriki of which bijū—ask your Kage for more information). Able to recognize S-rank missing-nin prior to meeting them. Able to recognize clans and bloodlines with four (4) or more people prior to encountering them. Access to general knowledge of canon techniques of B-rank and below. Access to general knowledge of custom techniques C-rank and below assuming they have been used at least once in-character. Able to learn S-rank techniques without a sensei, the jōnin rank, or the Character Points perk. Able to recognize foreign villages' jōnin prior to meeting them. Able to recognize A-rank missing-nin prior to meeting them. Able to recognize clans and bloodlines with three (3) or more people prior to encountering them. Access to general knowledge of canon techniques of A-rank and below. Access to general knowledge of custom techniques B-rank and below assuming they have been used at least once in-character. Able to recognize foreign villages' chūnin prior to meeting them. Able to recognize B-rank missing-nin prior to meeting them. Able to recognize clans and bloodlines with two (2) or more people prior to encountering them. Has precognition of one of every four incoming attacks. Access to general knowledge of canon techniques of S-rank and below. Access to general knowledge of custom techniques A-rank and below assuming they have been used at least once in-character. Able to recognize clans and bloodlines with one (1) or more people prior to encountering them. Capable of prophecy at this point. Has precognition of one of every three incoming attacks. Access to general knowledge of custom techniques S-rank and below assuming they have been used at least once in-character. "At one with the universe"; able to sense, but not utilize, nature chakra, meaning able to sense the larger occurrences going on anywhere in the shinobi continent. Able to recognize C-rank missing-nin prior to meeting them. Has precognition of one out of every two incoming attacks. Last edited by Estrios on Tue Jul 19, 2016 12:39 pm, edited 1 time in total. Might, Will, and Fate are special stats your character have that are unique from others because once you use them they're gone for good and cannot be replaced except under extraordinary circumstances. They represent your position in the world as a player-character, a manifestation of that phenomenon in fiction where the main cast always seems to pull out the odds. All characters start with 4 special points to be placed any way they want into the three different stats. Might is used to enhance offensive power, create crushing blows and set up the 'perfect' attack. 1 Point: Double your strength, reflexes, or coordination for the purposes of a single, non-technique based attack (Do not waste this on a stat that is already Godlike, stat caps still apply). Will is used to enhance defensive power, resist poisons and break genjutsu. 2 Points: Temporarily resist the effects of a poison for 3 posts. 2 Points: Instantly break a genjutsu and gain temporary resistance against that same genjutsu for the rest of the topic, assuming you've already realized you are in a genjutsu. 2 Points: Temporarily receive a 1 tier boost in Stamina for the rest of the topic (Maximum Godlike, kids!). Fate is spent to twist destiny ever so slightly as to avoid your ultimate demise. 2 Points: Avoid, tank, survive, or otherwise somehow thematically evade an attack, either lethal or non-lethal. +1 Might upon reaching Legendary, and +2 upon reaching Godlike(for a potential total of +3 might). +1 Will upon reaching Legendary, and +2 upon reaching Godlike(for a potential total of +3 will). +1 Fate upon reaching Legendary and Godlike(for a potential total of +2 fate). Any instance of "doubling" means you add the number of tiers you currently have up, then add that many to what you have. Godlike is the cap! Godlike. Is. The. Cap.